After being named the 2006 Ka Himeni Ana winners, Pilioha proudly posed with Marlene Sai. Group members, from left, are Kamuela Kimokeo, Gary "Kalehua" Krug, Jr. and Glenn Mayeda Jr.
Pilioha approached last year's Ka Himeni Ana competition with trepidation. 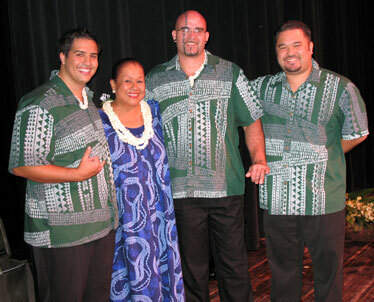 The trio -- Glenn Mayeda Jr., Kamuela Kimokeo and Gary Kahlehua Krug Jr. -- was accustomed to microphones, Mayeda said, and Ka Himeni Ana requires that vocalists perform without them. Moreover, Mayeda, the group's bass player, usually uses an electric bass guitar, not an acoustic stand-up bass. "I switched for many different reasons, most of it being because electric bass is more transportable," Mayeda explained. "I don't get to play (stand-up bass) very often. Just for Ka Himeni Ana, and a few other shows we play I will, but transporting it is a big issue." No joke! Whether hauling instruments from one local bar to another, or flying to shows on the mainland or Japan, a electric bass in its case takes up a lot less space. But purists should find Mayeda hauling his full-size stand-up bass to Hawaii Theatre on Saturday for Pilioha's guest spot at Ka Himeni Ana 2007. The contest will be one of the biggest events of the year in traditional Hawaiian music. Richard M. Towill created Ka Himeni Ana in 1983 with the hope of encouraging a revival of interest in traditional nahenahe (sweet, melodious) unamplified Hawaiian music. Each group must include no fewer than two and no more than five singers, and at least half the singers must also play an instrument. With the exception of steel guitar, those instruments must be acoustic: guitar, bass, ukulele or autoharp, or any of the instruments used by Hawaiians prior to 1778. Instrumentation aside, Mayeda says singing without microphones and stage monitors is another challenge. "Ka Himeni Ana brings groups like us -- who started off being acoustic, practicing in our garages and playing for family, and then progressing to now where we only play when we're plugged in at the bars and concerts -- back home." The acoustics were a challenge, he said. "I don't know where the sound goes (in the theater), but you can sing as loud as you want to and it just dies, so you try to hear the next person and what they're doing." Pilioha overcame those challenges last year and joined Ka Himeni Ana winners who have gone on to commercial and critical success. Kipona Leo Hawai'i, winners in 1986, became the nucleus of Na Hoku Hanohano Award-winnng Ho'okena in 1989. Dean Wilhelm and Barrett Awai, performing as Pai'ea when they won the competition, became Hoku Award winners this year as members of Kaukahi. Three other noteworthy winners of years past are 'Ale'a, Kanilau and the trio of Del Beazley, Chris Kamaka and Ku'uipo Kumukahi. Pilioha, already three-quarters done with a debut album at the time of last year's competition, finished "Pilioha" and released it on their own label, Pilioha Music, in March. The album was released in Japan last month. There have been other milestones as well. Kimokeo got married. Mayeda and his wife celebrated the birth of their second child. They've also been traveling, to the mainland and Japan. "That would be a full book in itself on how busy we've been this year," Mayeda says. He adds that they're working on material for a new album, but because they control the record label, there's no pressure to rush the process. They plan to start recording in December and have the album out by the end of next year. "With us, we try and create originals, and stuff like that usually takes the longest, rather than putting out covers of everything. We have some originals that we still want to polish up and see if it fits into a theme, 'cause we'd like to create a theme for the album and not just pull things out of left field."